1. A character observation chart for student to take notes on characters and their backgrounds, suspicious activity, fate, etc. 5. A "How Guilty Are They?" chart that students use to prep for an in-class debate focusing on which character is the "most guilty"
This is the first full novel I do with my students, so we create mind maps to help move our process along. I highly recommend using the mind map activity directly after reading to help students understand the novel. 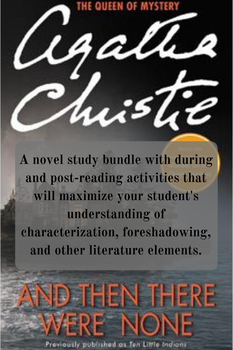 Check out my Mind Mapping Bundle or the full-color mind map directions to use with this and ANY novel study.